Happy belated Thanksgiving! I hope you all ate ya faces off. We had our family Thanksgiving on Thursday, with something like 35 people, 3 turkeys, 4 sweet potato casseroles, 18 appetizers, and 1 pretzel jello. Then, I headed back to Baltimore on Saturday, because the GS had his mom and sister and cousin in town for Thanksgiving. If she wasn’t my BFF/if I hadn’t already been brainstorming baked goods for this exact reason, I might have been offended. He had the best of intentions. Unfortunately I had never made nor EATEN a pecan pie in my life, and thus began the foodgawking, googling, and foodnetwork.com-ing to research. Most pecan pie recipes call for a cup of corn syrup which makes me gag, so I looked for one without it. I also insisted on making my own pie crust because I figured, go big or go home. Maybe you’re all sick of pecan pie by this point. If so, I apologize. But if you indulged in pies of the pumpkin/apple/chocolate variety, or perhaps a little (a lot of) cheesecake, this pecan pie could be just what you need. Combine flour, sugar, and salt for the pie crust. We have a tiny food processor at home so I did the crust by hand, but if yours is big enough feel free to make your life easier. Combine the butter and Crisco with the flour until the fat is evenly distributed. We do butter for flavor and Crisco for flakiness. Add the ice water and combine until the dough holds together. Form a disc and wrap in plastic, refrigerate for at least 1 hour. Combine sugars and eggs with a hand mixer until fluffy. Add the flour, butter, vanilla, milk and chopped pecans. Cover and refrigerate for at least a half hour. Press your crust into a 9 inch pie plate. Stab the bottom with a fork all over to prevent it from puffing at the bottom. Fancy fork pattern around the edge is optional, but recommended. Pour your filling into the crust- chilling it for a bit lets it firm up so it isn’t so soupy. Bake at 325 for about 15 minutes. 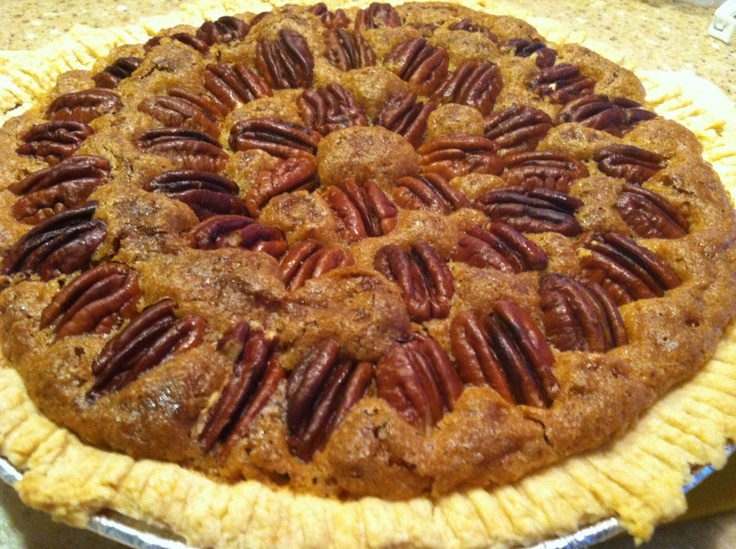 Pull out the pie and add your pecans around the top. The reason I baked it for a little while first was so that the pecans would stay on the top instead of oozing into the middle. Put it back in for another 40-45 minutes or until (mostly) firm. The crust is buttery but not sweet, the center of the pie is super sweet, and the nuts add a nice crunch. I know there are a lot of pecan pie haters (ahem, Sheila) but I thought it was delish. And everyone else seemed to like it. But the GS could have been blackmailing them to say that, so maybe you should try it and let me know.